Many datasets have physical coordinates which differ from their logical coordinates. Xarray provides several ways to plot and analyze such datasets. As an example, consider this dataset from the xarray-data repository. In this example, the logical coordinates are x and y, while the physical coordinates are xc and yc, which represent the latitudes and longitude of the data. Let’s examine these coordinate variables by plotting them. Note that the variables xc (longitude) and yc (latitude) are two-dimensional scalar fields. If we try to plot the data variable Tair, by default we get the logical coordinates. In order to visualize the data on a conventional latitude-longitude grid, we can take advantage of xarray’s ability to apply cartopy map projections. The above example allowed us to visualize the data on a regular latitude-longitude grid. 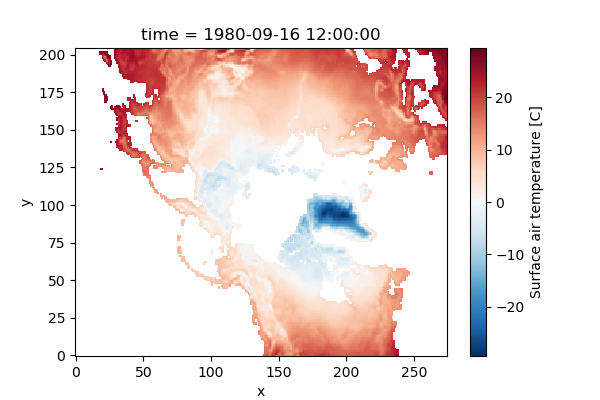 But what if we want to do a calculation that involves grouping over one of these physical coordinates (rather than the logical coordinates), for example, calculating the mean temperature at each latitude. This can be achieved using xarray’s groupby function, which accepts multidimensional variables. By default, groupby will use every unique value in the variable, which is probably not what we want. Instead, we can use the groupby_bins function to specify the output coordinates of the group. 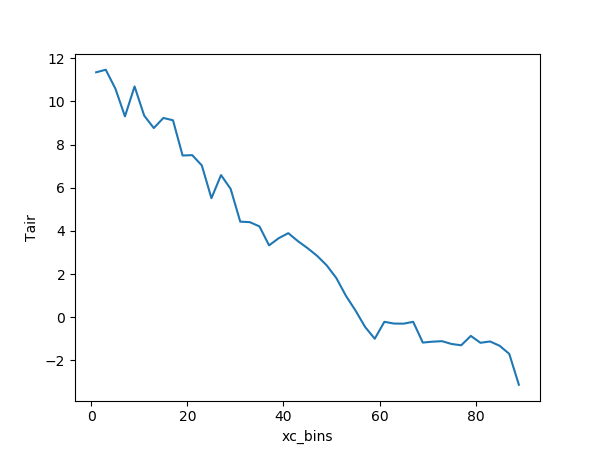 Note that the resulting coordinate for the groupby_bins operation got the _bins suffix appended: xc_bins. This help us distinguish it from the original multidimensional variable xc.